You’ve built your website. You’re posting on social media, you’ve got a newsletter, you’ve run a few ads, but it’s just not sticking. It seems that your efforts are not working. You’ve tried all the tools, you are paying for lots of subscriptions, you are working hard every day, but something is just not right. You’re overwhelmed and exhausted, but just not getting the right type of customer. Where do you go now? How do you get your ideal customers? Where are they hiding? The first step we take at Lara Brockie Consulting is to understand your customer value journey. The customer value journey is the path your customers take to find out about you and your services, follow you, buy from you, and buy again. We will work with you to review your current sales and marketing activities, and understand how you get and retain customers. We will perform a full audit of your customer value journey and every interaction your prospects and customers have with your company – from when they first find and research you, to their first purchase and beyond. 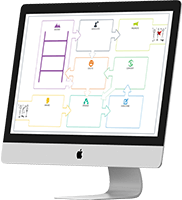 We will then map out an optimised path and activities to take your customer through the eight stages of the Customer Value Journey. A follow up video conference call to discuss the report and next steps. Click on the button below and enter your details for a 15 minute no obligation call to discuss your online marketing needs. We're very friendly and helpful!